The rate of natural disasters and humanitarian crises have highlighted the need for safe and efficient delivery of humanitarian aid to devastated areas. 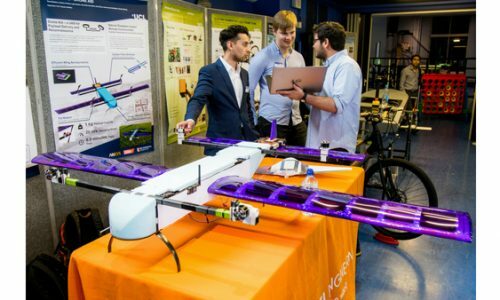 Our team set out to tackle this problem through the design, manufacture and development of an autonomous unmanned aerial system. 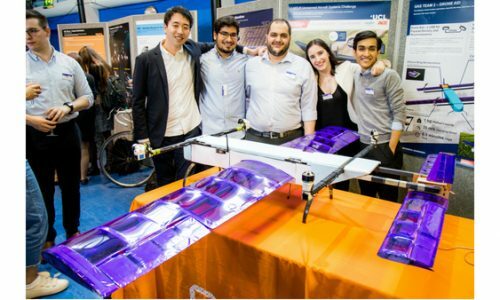 This challenge involved a full design and build cycle of an UAS with specific mission objectives. To be regarded as fit for purpose the UAS needed to operate automatically, while also performing a series of tasks such as area search, navigating waypoints, accurately dropping payloads and returning to base via a defined route. The UAS was also required to satisfy all functions and constraints defined by the requirement for successful flight operation, sustainability and humanitarian aid. 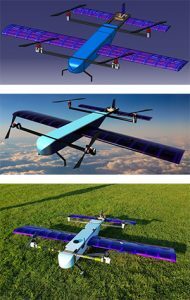 Our solution consists of a Vertical Take-Off and Landing (VTOL) UAS, capable of flying as both a quadcopter and fixed-wing. The UAS takes off and lands vertically, and hovers over targets using four propellers in a quad copter configuration. After take-off, a tilt-mechanism rotates the front two propellers by 90 degrees for transition to forward flight, where lift is achieved using wings and control surfaces. 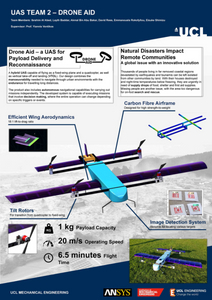 This design allows us to capture the main advantages of both quadcopter and fixed wing flight, making it suitable for urban environments and areas with damaged infrastructure. The quadcopter allows more accurate payload delivery than that possible with fixed wing; while when in fixed wing flight it is capable of travelling long distances at high speed and efficiency, due to the lift provided by the lifting surfaces. The autonomous capabilities of the UAS can be divided into 3 major subunits: autopilot, navigation and target detection. Ardupilot was used for the low-level control of the aircraft; while high-level control and conditional mission execution was achieved with a suitable mission design through the use of Dronekit-python. Object recognition was required to identify potential targets. The convolutional neural network (CNN) method was used due to its superior computational efficiency and reliability, as well as its extensive future potential. As part of promoting the product and emphasising the role engineering plays in solving problems such as the real-world scenario described, an outreach scheme was devised. 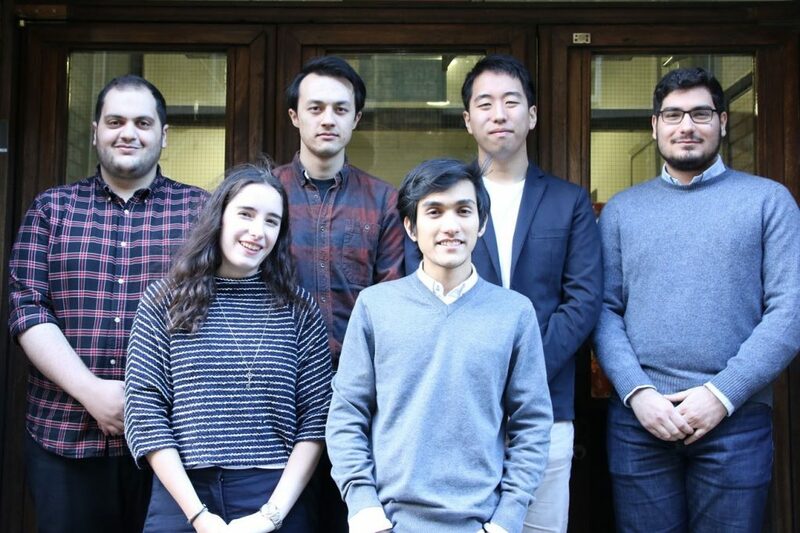 This consisted of a presentation targeted at a non-technical audience, which outlines the project background, the application of the design cycle methodology and the results of initial testing. 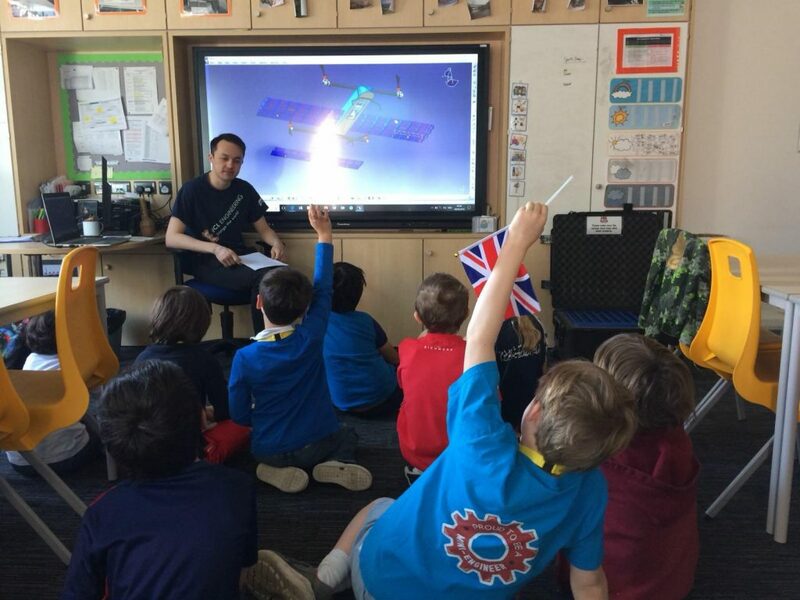 The presentation was given to a class of primary school children at the innovation and inspiration lab, Mini-Engineers, along with a Q&A session where the children asked about the design in more detail. We are very grateful to our sponsor who has supported our cause!